Trinket on day one.. calm and content! Cutest paws in town! Impossible to resist her charms!! Little Trinket.. lap lover.. play girl.. tiny dancer.... Social butterfly.. eyes as big as giant marbles!! She's all that and so much more! She is sssoooooooooo soooooooo cute and super friendly.. greets all new people like a professional welcoming hostess! ! From day one Trinket was all in with socializing.. 4 legged and two legged! 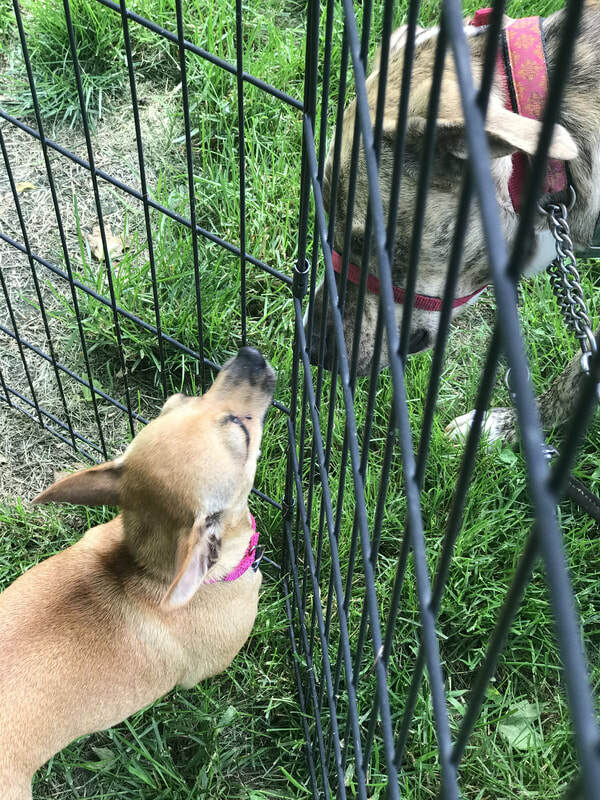 ​Trink is great out walking with a pack.. she enjoys quiet time and napping in her crate.. her neighbors can sound off begging for attention.. but Trinket doesn't complain.. come to think of it she doesn't seem complain at all! Everyone loves her.. she's easy going.. PLUS.. look at her feet... they are some of the cutest we've ever seen! We really do love everything about Trinket..